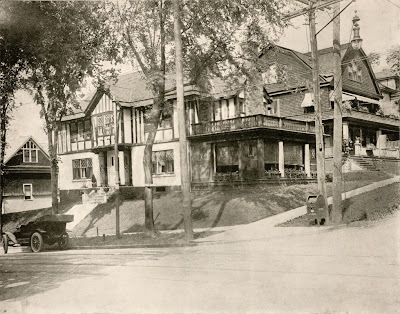 One of my near-daily walks or bike rides crosses the Eastside intersection of Walnut Avenue and Madison Street, where one of the slowest lights in the city allows me good time to look at three surviving examples of Arts & Crafts architect Ward Wellington Ward's work on University Hill. Ward (1875-1932), of course, was Central New York's most prolific and popular Arts & Crafts architect. On the southeast corner is the large and dominant Sherbrooke Apartments, built in 1914 for George Wilson, an officer in the Wilson Bros. Lumber Company, and later president of the Wilson and Greene Lumber Company. This is perhaps the largest Arts & Crafts style building in Syracuse - or at least it houses the most people. According to architect Allen Kosoff, his father, Samuel Kosoff, was the contractor for the building construction. 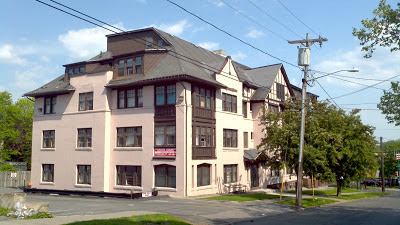 The building has served as an apartment building for most of its life - though it owned and operated by Syracuse University as a women's dormitory between 1955 and 1976. Syracuse, NY. The Sherbrooke Apartments. Ward Wellington Ward, arch. (1914). Madison St. facade. Photo: Samuel D. Gruber (March 2013). The Sherbrooke is kept in good condition. Last year there was roof repair and one can frequently see owner-sponsored maintenance on the structure. Most of the original features, including many in the interior, are intact. The biggest change can be seen on the west, facing the parking lot and 1960 school addition to Temple Concord, where one can see changes to the upper floors. But the Arts & Crafts style fenestration with varied sizes and substantial wooden framing of the windows is intact on the Walnut and Madison facades. So too, are the deep eaves and variegated roof line. The building was listed as a local protected site in 1980 and placed on the National Register of Historic Places in 1997 (see Carlson, Richard (August 15, 1996). 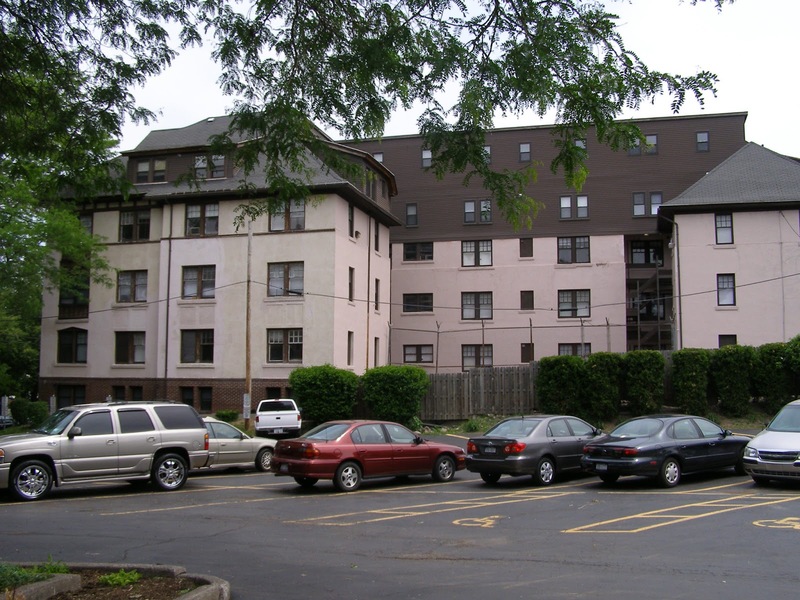 "National Register of Historic Places Registration: Sherbrook Apartments"). Catercorner to the Sherbrooke is the Herbert Walker house, built in 1911 and still mostly intact, although a new wing was added replacing a porch and terrace on the Madison Street facade. The house is now apartments. It is not listed as a local protected site but is designated as National Register eligible, but the nomination has not been written or submitted. Syracuse, NY. 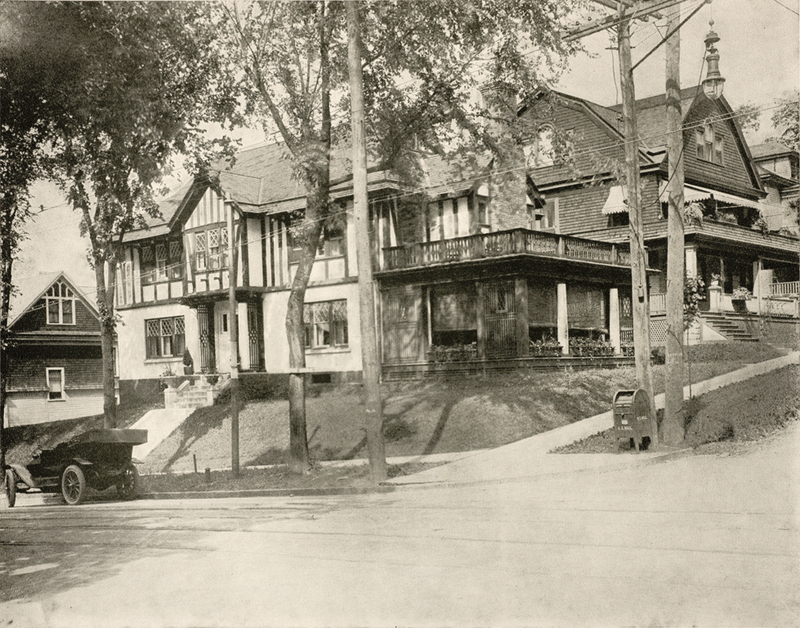 The Herbert Walker House at 519 Walnut Ave. Ward Wellington Ward, architect, 1911. Photo: Samuel D. Gruber (March 2013). Syracuse, NY. The Herbert Walker House at 519 Walnut Ave. Ward Wellington Ward, architect, 1911. The hosue is well-designed for the site, for optimum visual effect. The off-center project bowed bay creates a double facade to be seen by those heading south, toward Walnut park and the University. Photo: Samuel D. Gruber (March 2013). Syracuse, NY. The Herbert Walker House at 519 Walnut Ave. Ward Wellington Ward, architect, 1911. The south end was originally a porch with upper terrace. This was later converted for interior (apartment?) space, but the architectural style was maintained. Photo: Samuel D. Gruber (March 2033). Syracuse, NY. The Herbert Walker House at 519 Walnut Ave. Ward Wellington Ward, architect, 1911. The original and still the main entrance. Photo: Samuel D. Gruber (March 2013). Just down the street at 502 Walnut is another houses, determined in the city's Ward Wellington Ward Cultural Resources Survey of the 1990s as being deigned by Ward. Built for Samuel Cook in 1910, it is apparently much altered since. Syracuse, NY. 502 Walnut Street. said to be the Samuel Cook House, designed by Ward Wellington Ward in 1910. It is now a medical office. photo: Samuel D. Gruber (March 2013). Standing in the street in front of 502 and looking south one sees the Ward building dominating the approach north to Walnut Park. I don't known when Walnut was turned one-way going north, but one sees what is missed by changing the traffic patterns. Buildings were designed to be seen from certain views - and many of these have been subverted or destroyed by latter traffics patterns. On nearby University Avenue, now re-established as two-way, it is too late for most of the grand houses. They've been torn down. But it is nice that at the Northern end of the street both Temple Concord and Grace Episcopal Church can be viewed by (driving and biking) passers-by from different angles. I'll be posting more throughout the spring about familiar - but overlooked Eastside buildings. Syracuse, NY. The Avery-Burton House, 317 Bear Street. Photo: PACNY, 1980s. 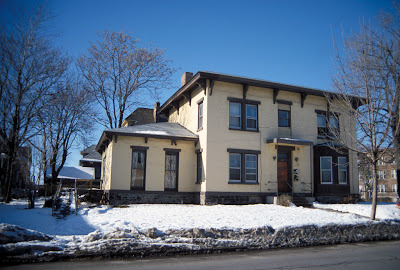 The other day I posted about the mid-19th century Catherine Murray House on Danforth Street on Syracuse's Northside and its sad and continuing deterioration. The Murray House is not alone. Several other historic houses occupying prominent sites that were in good condition in the 1980s are also in bad condition and are at risk. All these houses should receive quick attention from the city's new Land Bank before they are past the point of saving. The Avery-Burton House, at 317 Bear Street, at the corner of Park Street, is one of the finest mid-19th century houses in the Washington Square Neighborhood. Architecturally, the once-attractive brick house combines Greek Revival and Italianate elements. Historically, it is associated with the Salt Industry of the old Village of Salina. The house now boarded up, has unfortunately lost some of its earlier details, but it is mostly intact - at least on the outside. When Benjamin A. Avery (1817 - 1882), who had come to Syracuse from Groton, Connecticut, built the house, he owned a fifty-kettle salt block near the Oswego Canal. As reported in Eva Hardin's essential Syracuse Landmarks: An AIA Guide to Downtown and Historic Neighborhoods (p167), Avery helped organize the Central City Railroad, which in 1860 started to run between Clinton Square and Wolf Street as the city’s first horse-drawn trolley line. In 1865, he sold his home to Henry Burton, a second-generation salt manufacturer. The house was included in Hardin's book, but like most of areas houses was never designated a local protected site of nominated to the National Register of Historic Places. At the time the Hardin, Dennis Connors and others were documenting Northside and other city houses in the 1970s and 1980s that intention and expectation was that many of these would receive the recognition they deserve. Now, while still potentially eligible for such designation, the now-deteriorated condition may make that difficult. City officials are now moving ahead with efforts to re-survey the area that could lead to new preservation initiatives. Fortunately, there are still many fine houses in the neighborhood that are cared for and are in good condition. Overall, however, my walking tours around the area over the years have shown - often quite shockingly - the continued fraying at the edge of the oldest of Syracuse' residential districts.